Having submitted my haunted trip long drive experience to carconnect.in, it was time to write my carconnect experience post. At the beginning after connecting my Facebook to carconnect.in, I was asked few questions regarding my favourite car, dream routes and so on. At that time itself I realized that I was going to spend some quality time out there on this fabulous website. It was indeed an amazing experience exploring Carconnect.in Everything about this website seemed good. The Cloud like structures on the home page of carconnect.in looked good to the eyes. Those two clouds indicated the Car Experiences and the Long Drive experiences. My fingers couldn't stop myself from clicking on the Car Experiences cloud where I could see different car models. I was fascinated by this concept and with a blink of a second, I clicked on my favourite car model which was Hyundai. It opened a new page which listed the car experiences of like minded people. It was filtered according to the car link that we select i.e in my case it was filtered on the basis of users who wrote their car experiences for Hyundai. Similarly I did the same for the Long Drive section. I could rather call it a customized grid. This long drive cloud displayed different cities. So when I click on Mumbai, it would display the road trips relevant to the Mumbai location. For a layman like me , it becomes simple and for someone who is less techsavy it should be a good experience exploring carconnect.in. Meanwhile I am still virtually strolling on the home page of the website. On the right side, I could see some grids on the right sidebar which displayed popular car experience, top badge owner,popular long drive experience and so on. At the bottom, I could see top car and top long drive experience. It was good to see a familiar face on the Top Car experience section in form of Mr. Arvind Passey, a well known blogger from the Capital City of India. As I moved on to the next available links on the navigation bar, I could see few of my friends listed on the 'My friends' tab categorized on the basis of their long drive experience and car experiences. It was a good visual representation and it looks good and creative. 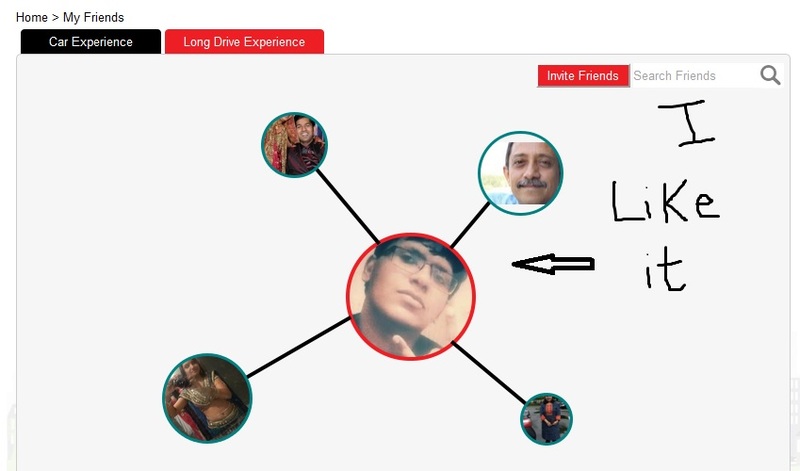 I haven't seen such way of representing friends network in any other site. So in one way this was one of the most exciting feature here like showing the interconnection between friends similar to the graphical binary tree structure in Computer Science. 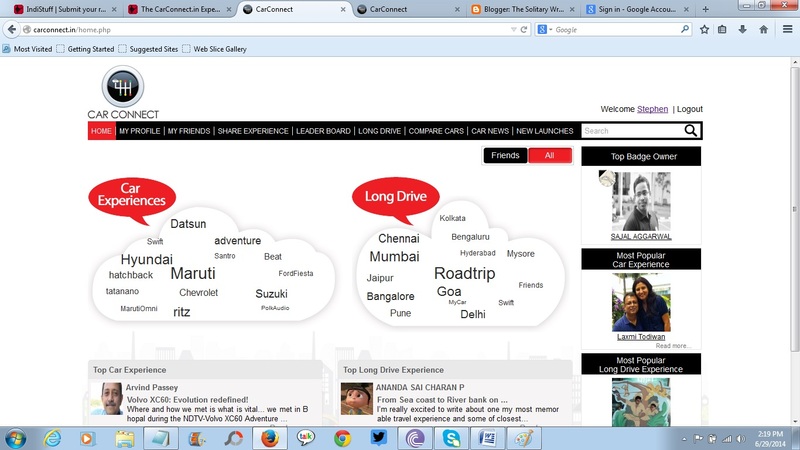 Then I moved on to the 'Share Experience' tab where you could share either your long drive or your car experiences. As I navigated further I learned that there is a 'Leaderboard' tab which contains the owners of different badges namely -Platinum,Diamond, Gold, Silver, Bronze etc. The different badges are awarded on the basis of the experiences we share. So likewise when you register on the website for the first time then you would be awarded a bronze badge. Isn't that something worth to flaunt? Again this was categorized into friends and all. So I could see my Facebook friends and their badges when I clicked on the 'Friends' button. I liked the responsiveness and the usability of the website. Being a Quality Analyst who analyses different applications on the basis of their performances on different browsers and OS platforms, I realized that this websites stands above the other websites. The user friendly nature of the portal has actually impressed me. I swiftly moved on to the next tab named 'Long Drive'. So this was something outstanding and different. I could see a grid containing different city names which was the starting point for long drive experiences. Suppose whenever I clicked on a particular city, I could see results containing long drive experiences which actually started from that city. So by reading those experiences, you could actually muster enough details about does and don't and more insights regarding the road trip. The next tab was 'Compare Cars'. I was actually waiting for such a feature. Being an ardent car lover, I would like to compare different cars on the basis of their specifications, models and features. So there is a provision to select 2 different cars on the basis of their brands, models and variants and I could compare it. To be frank, I was actually disappointed when I saw the 'Email the comparision' button. Being a QA Folk, I would definitely vouch for a system which dynamically displays the results. There is this button called 'Email the Comparision' after clicking on it , the comparision result would be mailed to our email id. I actually had a good look at the sample pdf which was displayed there. So clicking on it, I actually got an insight of how the look and feel of the pdf file would be. The details were adequate and something which I desired. The next tab was the 'Car news' where you could find all the news regarding different cars. Guess what? They also allow you to share your car related news.The last tab is the New launches where details and information about the new car launches happening in the city would be displayed. I have few pointers though I wish this would be taken as a constructive feedback. The overall appearance of the website looks bland. I think the color combinations at certain screens could be changed or reviewed. Also the stationery grid on the right side bar is constant throughout all the screens. From my experience as a QA, I would certainly like it if it was moving instead of its stationery stat. Like we could make it move from top to bottom or reverse. 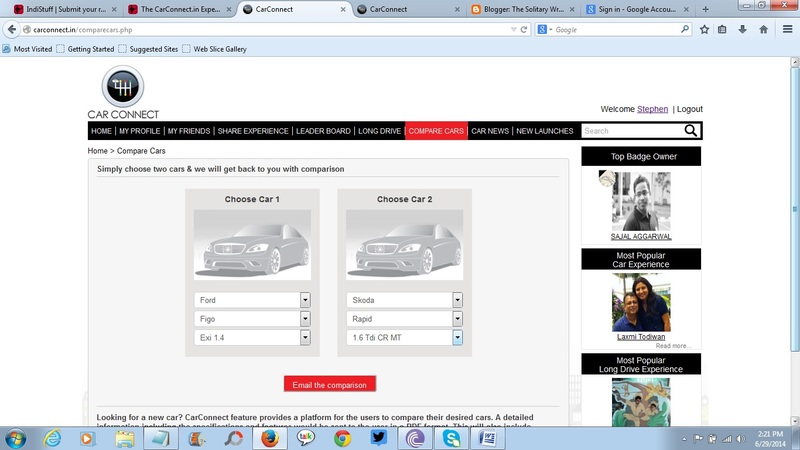 That would give a good feel to the end users who browse through the website for car related details. What I like a lot about this site is the use of Facebook connectivity as a social media connectivity. But I wish there was twitter connectivity too and also provision for registration using email id. This would make it look more good. Thats my 1 cent! There are lots of white spaces at top, above the navigation bar and to the left and right side of the screen. So the central post area would be made wider to incorporate new and exciting features. I actually loved the logo of carconnect.in displaying the gear patterns and a car above it on the reverse gear heading to make its stand. It was awesome and creative. Hats off to the person who designed it. I also happened to read few of the car and long drive experiences of other users and my friends and few of them were really good. I would like to say that the concept of carconnect.in is good and with time and few improvisation, this could be the next big thing. I loved spending some quality time exploring this website and was a different experience all together.